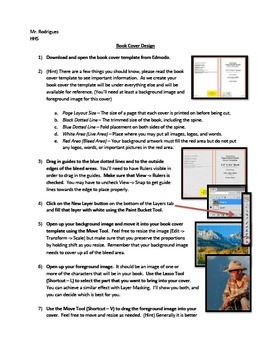 Enclosed within the .zip file is a .docx file with instructions for students and a book cover template in .pdf file format. Students should take the time as a pre-activity to brainstorm the items that are necessary for a book cover; the genre of book, what type of imagery they want/need, title, author name, and a brief synopsis for the backside. The template was obtained through CreateSpace and similar templates could be obtained elsewhere.